15 December 1946, 9 rue Auber, Opera quarter in Paris: the Union of European Federalists (UEF) is established at the headquarters of ‘La Fédération’, the main French federalist movement of the time. The Italian delegation to the first UEF Congress, including Gustavo Malan, Guglielmo Usellini, Ernesto Rossi, Altiero Spinelli and Alberto Cabella. Montreux, Switzerland, 1947. Additionally, certain groups were only interested in the establishment of a European federation, politically speaking, others thought mostly about instating a new organisation, others about organising peace, and others still about global federalism. Some referred voluntarily to an Anglo-Saxon model of federalism; others, specifically French speakers, related to Proudhon and the libertarians of the preceding century or to the individualist thinking that emerged from debates and ideas during the course of the 1930s. For others, Hamilton still represented the essential reference. Such a mixture of ideas was quite surprising. They needed to be channelled. This mixture made up the richness of UEF but in many ways it made life complicated for the movement over the course of the 1950s and even in to the 1960s. Could it have gone differently at the start of our grand adventure in that European wasteland in which everything had to be rethought and rebuilt? In Great Britain, for example, Miss Josephy, ex Vice-President of the Liberal Democrats, and one of the most active federalists of the time, was the incarnation of this mix of globalist, Atlanticist and European perspectives, representing one of the most symptomatic expressions of the Outre Manch federalist tradition. The constitutive meeting of the UEF took place on 15 December 1946, under the presidency of a man who incarnated the debates of the third French republic. Ex deputy of Ardèche, Gaston Riou was the President of a group named ‘Union économique et douanière européenne’. In 1929 he published a premonitory work called ‘Europe, ma patrie’ which included a declaration by Arisitide Briand. May I remind you that Aristide Briand, in the name of the French government at the time and with the support of Gustave Streseman, called for the people of Europe – atop the stage of the League of Nations – to tie a “federal knot” to each other. The “conjurés” of rue Auber, despite their differences, decided unanimously to convene a first Congress, which was held in Montreux from 27 to 31 August, 1947. They also decided that the young UEF, which did not yet have a legal statute, would get one, conforming to Swiss legislation. The process was finalised with the establishment of its headquarters at Palais Wilson in Geneva. They then asked Alexandre Marc, journalist and 1930s avant-garde, to become the first secretary-general of the new organisation and Hendrik Brugmans, future dean of the College of Europe, to be its first president. The first task would be to control the post-war federalist explosion: about fifty clubs, circles, and unequal movements in about ten countries. There were, for example, no less than around fifteen in France alone and about twelve in Belgium. I conclude by mentioning that as a young man, I myself had been involved in the federalist movement for several months. Six years later, I became secretary-general for France. I therefore personally knew the witnesses and actors who were involved in the events that I just related. This authorizes my testimony of the day. 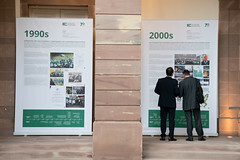 When the delegates of this memorable gathering separated, in to the bitter cold Paris night, immensely dark and sad, deprived of everything (because of the rations which disappeared definitively in 1949), the first post-war sign of European hope finally materialised: the UEF was born.